My trusted partner since my days in college. Don’t settle. You don’t have to. It’s easy not to settle when you have the power to stitch it up yourself. Get exactly what you want, in the fabric you want, any time you want. Go pull out that sewing machine and say hello to it. Dust it off, oil it up and make it your friend. Let’s start with the basics. We need fabric. When we go shopping for fabric, remember that the nicer the fabric you use, the better the finished garment, curtain, or bedspread will look and perform. We will not be competing with Walmart fast fashion with our work. We are going to compete with Neiman Marcus. It’s just not worth your time and talent to work with inferior materials. They will only disappoint, and you will think that you can’t sew. It’s not you. It’s the fabric! Frankly, you just can’t “out cheap” the discount stores anyway. No matter what fabric you use, your labor “cost” is the same. Those fast fashion clothes you find at stores like Forever 21 are made by women and girls who make pennies a day. You don’t want to support this, and you can’t compete with it. To that end, seek out the smaller independently-owned fabric shops. These shops cater to the professional crowd. They will be a font of information for you, should you need advice. Try asking for a silk satin at a chain store, and you will likely be shown two aisles. One filled with cheap acetate satin, and one filled with “silky” fabrics. In the independent shop, you will be shown gorgeous duchess silk. They know that satin is a weave and silk is a fiber, because they live and breathe what they do. They will tell you to use good thread, and good interfacing. They will run screaming from fusibles with you, and they will probably have classes to take as well. Find one of these places and make it a second home. Likewise, you want a good sewing machine. Look to the older machines for something that will last, and be a good value. To simplify things, one that is NOT labelled “Singer” is generally a good choice. There are exceptions. The older Singer machines are okay (except for ANY of the Touch ‘n Sew models). The Featherweight 221 is a good bet, as are the Rocketeer models 500/500, and the 401. The Singer 301 is the real find. Skip the 201 as they are too old, and the wiring will be bad. You can’t replace the motor, so it’s pretty much useless. For a solid machine you will never need to replace, look to the old Berninas. Bernina 830 Record/801/801S and the 930s are the dream machines. My 930 has been by my side since my college days, 30 years ago. The old Pfaff 130 and 230 are also fabulous. If you must have a new machine, look at the Brother line. With a decent machine, the right presser foot for the task, and the best fabric you can afford, you will find sewing to be much easier than with a machine and fabric that fight you. Buying cheap costs you more in time, frustration and the weighty disappointment of inferior results. 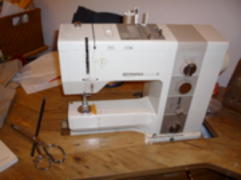 My Bernina 930 cost me $999. It was outrageously expensive. It took up all of my credit. I bought it after I tried to get by with a Sears Kenmore for my classes in college. Being frugal made my work frustrating because I struggled to get the machine to do what it was—apparently only in theory— made to do. After about a week, I packed it up and returned it to Sears, though I really wanted to throw it out my dorm window to see it crash into a million pieces. Alas, I could not afford to do this, cathartic as it may have been. Once I had the Bernina on my desk, my work just flowed through the machine. It was well worth the price, and if you break down its cost, it comes out (so far) to about 9 cents a day, and getting cheaper daily. In all that time, I have never put it away, and only had one major repair. It remains in the table I bought for it after I graduated, always ready to work. Now go. Get out there, and sew up something amazing. It’s easy, and you’ll look great.